By TruePublica: A war of words has erupted between the US and its G7 allies. This was just hours after the group had put on an apparent show of unity at the end of a tense summit who then announced a communique – that Donald Trump did not approve of. During the meeting, the issue of milk and dairy product tariffs was highlighted as an example by Trump that the Canadians were abusing the North American Free Trade Agreement of NAFTA. Donald Trump is right that American dairy farmers are angry about their current circumstances and fears for the future of the dairy industry. Canadian dairy farmers just want a level playing field in the dairy markets and see the dispute from a completely different angle. Trump is picking a fight with Canada who he says they are being hurt by their northern neighbours. He said that “some very unfair things have happened to our dairy farmers” in the USA. US dairy farmers used to sell a lot of milk and dairy products into Canada. However, the market for American products has fallen and now flowing back into the US and saturating an already over saturated market. Many farms are being told there is no market for their milk or dairy products. Due to American sanctions on Russia, their dairy farmers lost the entire Russian market in 2014. Then China started to reduce American dairy imports in 2017. Europe already has a fully saturated dairy market, therefore, US exports of dairy is finding it extremly tough to find a market anywhere in the world. The reality is that there is simply too much milk being produced in the US and Canada. To combat this, Canada has a different system. The government encouraged farmers to reduce its production of dairy and then imposed tariffs on imported dairy products from anywhere abroad, therby making themselves self sufficient. They achieved this without increasing subsidies to their farmers. US dairy farmers object to the tariffs that they cant compete against stating it is against the rules of NAFTA. But the US has not changed the amount of its own dairy production, thereby flooding its domestic market and then trying to sell it abroad, whilst still being heavily subsidised by their own government – far more so than Canadian dairy farmers. Hence the problem. And Donald Trump is ‘milking’ the situation because the mid-term elections are just around the corner and he wants to look tough on a market that has little overall impact on global trade, especially in terms of the G7. 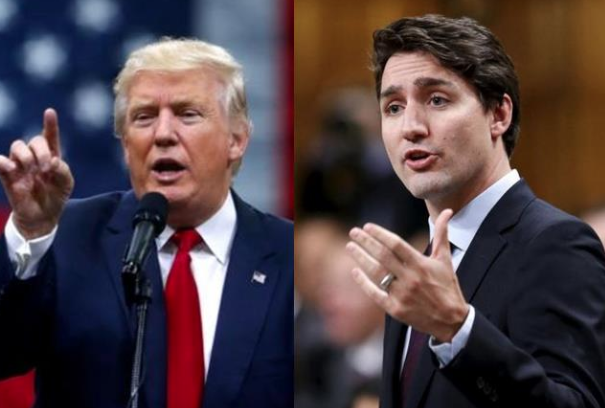 Canadian PM Trudeau can also look tough by battling against a belligerent American president – again, without putting much at risk. Both sides get increased approval ratings from their domestic voters. That’s a win-win – whilst the public is given the impression that international relations are totally falling apart and that their leaders are fighting their corner. This particular issue is no big deal but it does signal the potential for other countries to prepare themselves for upcoming trade negotiations that Trump is not in favour of unless, of course, they favour American workers first and foremost. And European allies are doing exactly that. In the meantime, there’s more to come on trade wars as the mid-term elections get closer.